Happy Birthday, Cynthea! I hope you have a ROARING good time!!! I'm always bursting out into song! My random musical outbursts are always brought on by something someone has said or done. 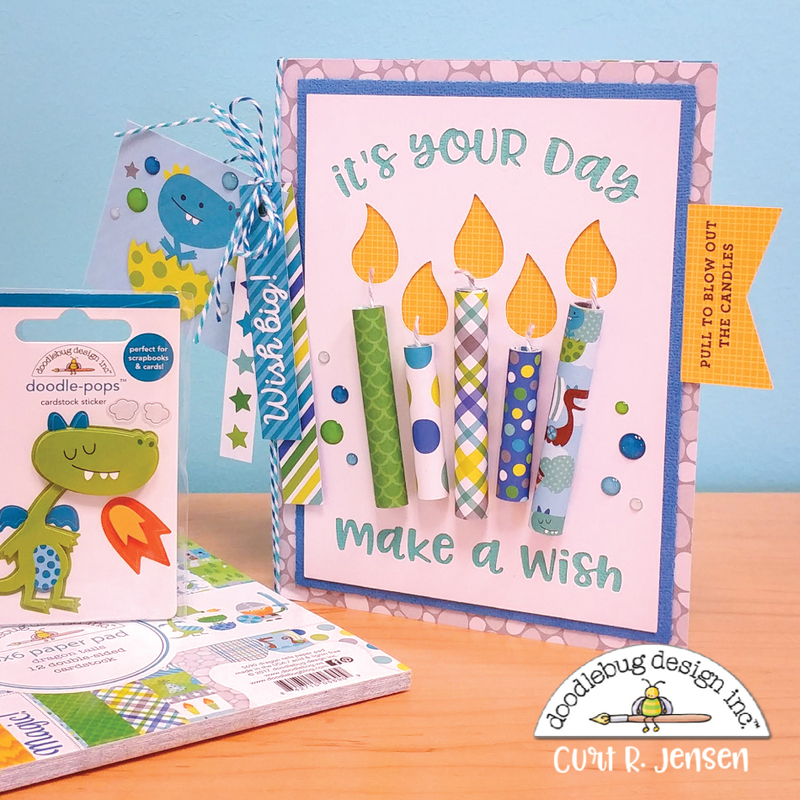 When I started working in-house at Doodlebug, I couldn't resist singing the theme song to the kid's TV series, Dragon Tales when I saw Doodlebug's Dragon Tails collection. I sing this song to Cynthea at least once a month, which she thoroughly "enjoys" since this ear worm gets stuck in her head. It's almost time for Dragon Tails. Come along and take my hand. Let's all go to Dragon Land! To make this card, I rolled strips of paper from the Dragon Tails collection with a piece of Doodle Twine in the center. The lettering and flames were cut out of the white paper with my Silhouette. And the yellow pull tab slides back and forth on a track behind the white, allowing Cynthea to "blow out" her candles.